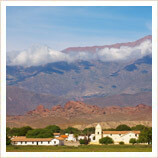 Mendoza lies in the foothills of the Andes, and in the heart of Argentina's wine country. 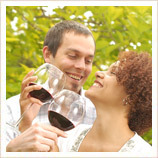 With a Mediterranean climate of warm summer days and cool winter evenings, the surrounding area has proved perfect for wine cultivation and although Mendoza is one of the biggest cities in Argentina, the relaxed pace of life, based around the extensive parks, tree-lined boulevards and pavement cafes make it feel smaller and it's undeniably an extremely pleasant place to spend a few days. 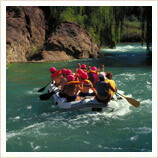 Most of Mendoza's better hotels are in the city centre, and it's almost certainly the best place to base yourself. Part of the charm of a trip to Mendoza is just enjoying wandering around the leafy avenues and pedestrianised streets, choosing which pavement cafe to sit in, or which restaurant to come back to later. 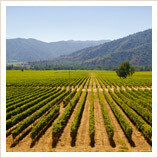 Even if you're not a wine buff, taking a wine tour from Mendoza is a superb way to see the surrounding countryside. Many tours will also include a traditional Argentinian asado (grill/bbq) which is another good reason to do it! There's really nothing better than sitting out in the beautiful Argentinian countryside, with a nice glass of red while someone obligingly grills a nice Argentinian steak for your lunch. As Argentina's biggest wine-producing area, there are more vineyards than you can shake a stick at, and although many people just prefer to have a day's wine experience, you could easily spend a week here in Mendoza, just visiting the leading wineries. Increasingly, Argentinian wine is moving away from the low and medium ends of the market and developing a real reputation for quality - a few days in Mendoza will give you the chance to see this process in action. And if you're experienced then you can also seize the chance to climb some of South America's highest mountains, including the mighty Aconcagua, which is just a short drive from Mendoza. 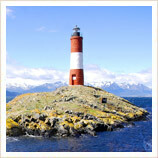 Several flights a day link Mendoza with Buenos Aires, and there are also regular flights to Salta, Cordoba and Bariloche. 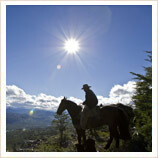 At present the only international flights are the thrice-daily hop over the Andes to Santiago de Chile. Mendoza has excellent road links south into Patagonia and north up towards Salta, as well as the major Ruta 7 to Buenos Aires and excellent inter-city coaches run in all directions. Ruta 7 also heads west over the Andes via the La Cumbre Pass into Chile and this spectacular journey, with views of Aconcagua is a great way to cross the border. Mendoza is quite a large city but the centre is fairly compact and hotels, restaurants and shops are all pleasingly walkable. 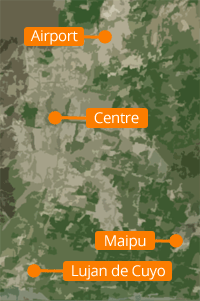 Failing that, you can use the city's new tramway system, which runs north to south, linking the centre and the outlying suburbs of the Maipu valley, where several important vineyards are located. No matter what time of year you visit Mendoza, you're pretty much guaranteed decent weather. Even in the depths of winter (June/July) it rarely drops down below about 5°C and this also tends to be the driest time of year. As you move into summer you get a little more rain, but given that temperatures get up to around 30°C the odd shower can be no bad thing, and even then it doesn't rain a huge amount. All our holidays in Argentina are 100% tailormade, so if you'd like to customise any of the itineraries you see above, or just start from scratch then get in touch and let us know - we'll be delighted to help you plan your perfect tour of Argentina's wine country. Although most people think of Mendoza simply as the centre of Argentina's wine country, it's also at the centre of Argentina's adventure holiday sector. In winter, the area has some of Argentina's best ski resorts, and in summer you can enjoy some superb white-water rafting on the Rio Mendoza, trekking, canyoning, and horse-riding!